World-leading productivity expert Graham Allcott's business bible is given a complete update for 2019. Do you waste too much time on your phone? Scroll through Twitter or Instagram when you should be getting down to your real tasks? Is your attention easily distracted? We've got the solution: The Way of the Productivity Ninja. In the age of information overload, traditional time management techniques simply don't cut it anymore. 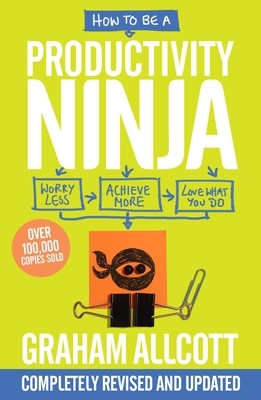 Using techniques including Ruthlessness, Mindfulness, Zen-like Calm and Stealth & Camouflage, this fully revised new edition of How to be a Productivity Ninja offers a fun and accessible guide to working smarter, getting more done and learning to love what you do again. Graham Allcott is an entrepreneur, keynote business speaker and founder of Think Productive. Think Productive run public workshops throughout the world and have run in-house workshops for staff at eBay, Heineken, American Express, JP Morgan, Paypal, the Gates Foundation and many more. He is the host of the popular business podcast, Beyond Busy. Think Productive's US office is in Novi, MI.